Several years ago I was privy to a conversation that didn't make much sense to me. The topic was whether or not PCs could be sold like cars, by model year instead of focusing on specs. The holy grail of PC sales has always been distilling the myriad of system specifications down to a simple, easy to understand number. Intel used to offer its iCOMP rating for microprocessors on PCs sold in stores, benchmarks like 3DMark have attempted to do the same thing as well. It'd be far easier however if consumers simply purchased based on model year; buying a 2008 model year PC would be better and faster than a 2007. The idea obviously didn't go anywhere and it didn't make a whole lot of sense to me given that, unlike cars, computers are generally not as emotional of a purchase. I think Apple has managed to change that. Nearly every year or so we get a redesigned Mac, iMac or MacBook, and in many cases while they are no faster than their predecessor - they introduce one or two new features or a new design that makes you want them, with all logic cast aside. It's a lot like buying a car. Apple sells its computers not only based on functionality, but largely based on the form and design. Now all manufacturers do this to an extent, it's just that none of the mainstream PC OEMs do it as much or as well as Apple. Apple's focus on design makes a lot of sense. All PCs can be created equal, these days Apple and Dell use the same components, so the only differences that Apple has to play with are the OS and the design. Thus investing more money into the OS and system design is the right move for a company like Apple. Last week Apple announced its updated MacBook, MacBook Air and MacBook Pro lineup. As expected the changes were largely aesthetic and the new machines look great. But there were also some pretty significant departures under the hood, thus giving me something to do here other than comment on how the curved corners are nice to pet. There are benchmarks to be run, battery life to be tested and something very unexpected to uncover about OS X vs. Vista at the end. I won't dilly dally for too long here, so let's get right to it. It turns out that all of the extra money Apple is spending on its notebooks goes into materials and build quality. It looks like there are two areas where that money is used: the aluminum chassis and the glass display cover. 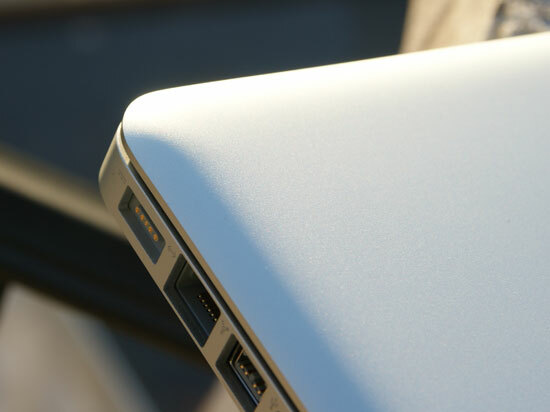 The MacBook and MacBook Pro are now made like the MacBook Air: carved out of a single piece of aluminum. That's actually a bit misleading, there are multiple pieces of aluminum that go into the construction of these things, but looking at the keyboard from above you see a single block of aluminum that has been shaped to look like a MacBook. 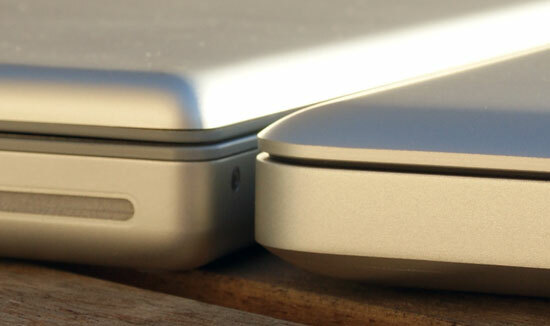 The PowerBook G4 and the first MacBooks had the keyboard built into a piece of aluminum that sat on top and there was another piece of aluminum that made up the bottom half of the notebook. The two screwed/snapped together and what you had was an aluminum notebook. With the new MacBook/MacBook Pro, Apple has effectively flipped its manufacturing process upside down. Instead of having a bottom that curves upwards and is capped off with a keyboard, the new models have a top that curves downwards with two plates that cover the bottom. The distinction is subtle but the difference is noticeable. 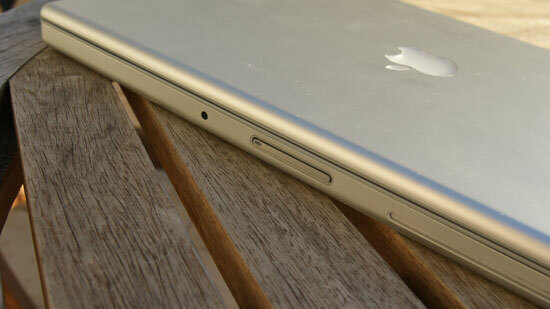 Rounded corners, it's like a big MacBook Air. Cute. Rigidity is one of the biggest factors in making a notebook feel like it's well built. This is one of the things that IBM got very right with its Thinkpads early on, and something that Apple honestly did an incredible job with on the MacBook Air. The problem with building light notebooks is that the lighter you go, the flimsier the materials and the worse they hold up over time. By making sure the part you come in contact with the most is made out of a single piece of aluminum, Apple helps convey a sturdier built product. Also gone is the bothersome latch from the MacBook Pro, the screen magnetically attaches to the keyboard surface when you close it. The latch on the old MBP was the cheapest feeling part of the machine, so I'm glad they fixed it. 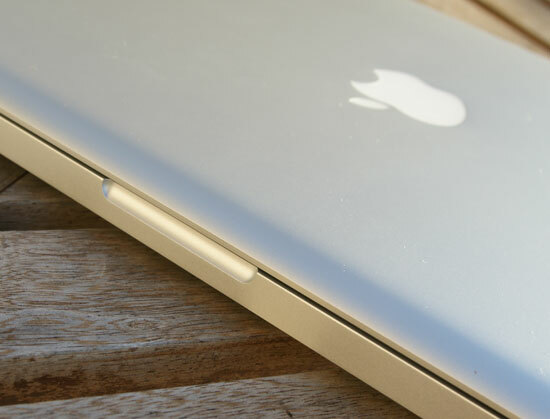 Apple also made it easier to access the hard drive on these things, there's a nifty removable panel underneath the notebook that unlatches without a single screw. With the cover removed you can replace the battery or, after removing a single screw, remove the hard drive (you'll need to take out four more screws to actually swap out the drive though). This isn't quite as easy as the removable HDD trays you'd find in a Dell, but it does look better. The design is far from perfect however, the new battery/HDD cover tends to rattle and definitely reduces the solid feeling of the notebook. Thankfully the parts of the notebook you interact with the most feel the most solid, it's just worth pointing out the imperfections. I am trying to identify if a new macbook pro 13" would be adequate for editing with Final Cut Express, and for that matter, Final Cut Studio. Unfortunately, it has a 5400rpm hard drive and that is not good for editing. But, I wonder if an optional ssd would be fast enough?? I would use the 13" for more mobile work and dock it with a larger monitor for more involved editing work. This is an uneducated guess, but I'm pretty sure that Quartz works in ways similar to X11, where changing graphics drivers requires a restart of the window manager. Vista is bloated resource hogging junk - You should have tried the OS many of use still use - Windows XP for battery life. I get over 4 hours on my R31 thinkpad with winxp pro. You photos comparing the glossiness and reflection on the screens was not fair, though. 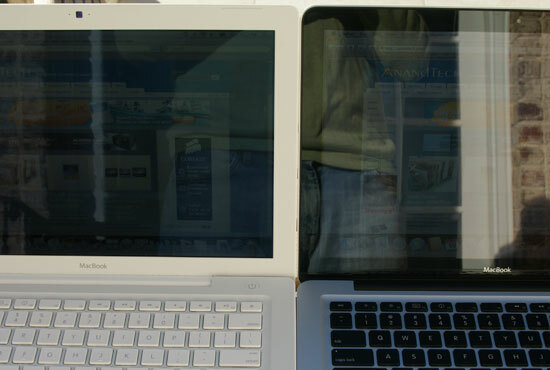 Please notice that the laptop on the right (the new MBP) is reflecting a portion of wall that has direct sunlight shining on it, and the laptop on the left is reflecting stuff that's in shadows. So even if the screens were equally reflective, the one on the right would show tons more reflections. nop, you are wrong. Both of them reflect stuff that have direct sunlight. Notice Anand's reflection for instance, or the wall on the left hand side of the old MB and the wall on the right hand side on the new one. Anand, why don't you test Vista installing it on the new MacBook Pro without using Bootcamp, you need to wipe out the drive and create a MBR partition and use Vista x64 SP1 (it supporta EFI), the only thing you need to know is that at startup you have to press the Alt key and manually select the Windows disk in order to boot from it, beside that everything else seems to work just fine with the Vista native installation (tested on a white MacBook Penryn 2.4 GHz 4GB ram). I have brand new Vaio Z laptop and I can get 5 hours battery life IF I disable Vista sidebar. It does not matter whether there's no widgets running, it seems to use 10-15% of CPU time no matter what. This translates into a big loss of runtime - I'd get 3.5 hours versus 5. Unfortunately, I like Sidebar as there are some useful widgets, as well as for eye candy so I feel Vista is crippled without it.